Kingdom’s Edge is the third book in the series and spans the time from Jesus to the tribulation. 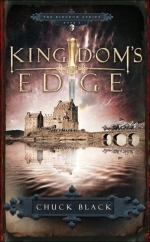 Kingdom’s Edge is the third book in the series and spans the time from Jesus to the tribulation. Cedric tells the story as he encounters a stranger from a distant kingdom. Cedric discovers that this stranger is a master of the sword and soon finds himself in an epic battle between good and evil. 142 Pages, paperback, price $8.99. The Kingdom Series novels are Biblical allegories that are set in a medieval time period. They cover the span of time from Genesis through the 2nd return of Christ. They are full of action and adventure where swords, knights, and battles are all Biblically symbolic. The allegory teaches Godly character, the adventure captures the imagination of all ages, and the action keeps teenagers engrossed from cover to cover...even non-readers! They are GREAT read-alouds! Deep symbolism with an action story makes excellent reading for ages 8 to adult. The series is one continuous story with characters that portray courage, loyalty, discipline, and honor.